At Loyalty Home Health Care, we use a team approach to address the growing need for home care in Pittsburgh, Pennsylvania and the surrounding locations. Along with our personal care attendants, home health aides, certified caregivers and care coordinators, we strive to achieve the best possible care for your loved ones. To help our clients live independently as they stay in their homes and in their communities. We are dedicated to providing the highest quality services possible with the same enthusiasm that any family member would have. We provide home care services with the loyalty to your loved one’s wellbeing. We found that more and more people are growing older into their retirement age and more of them still are choosing to remain at home. 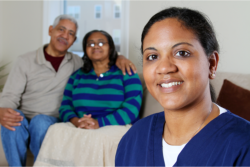 Staying at home has so many benefits that no other care facility can match. Your family is at home. You are familiar with the surroundings and you can have more freedom in pursuing the hobbies or activities you love. Loyalty Home Health Care understands this deeply because of our long standing caregiver experience. A lot of our clients are happier when they stay close to family and age in place. Home Care is also the less costly alternative to assisted living facilities. You only pay for the services you receive and the number of visits that your caregiver makes. Spend less when you retire and gain more from staying at home. Loyalty Home Health Care will provide the care professionals to facilitate personal care, companionship and homemaking assistance as you need them.